This dish is a hexagonal earthenware piece with floral prints molded around the rim of the plate, painted over in green, blue, and burgundy. A burgundy line is painted along the edge of the plate. The center features one of Benjamin Franklin’s most iconic maxims and an illustration transfer printed in blue on a white background. A coat of glaze is painted over the plate. This artifact is an alphabet ware—plates or mugs that have the alphabet or youthful scenes printed on the surface. 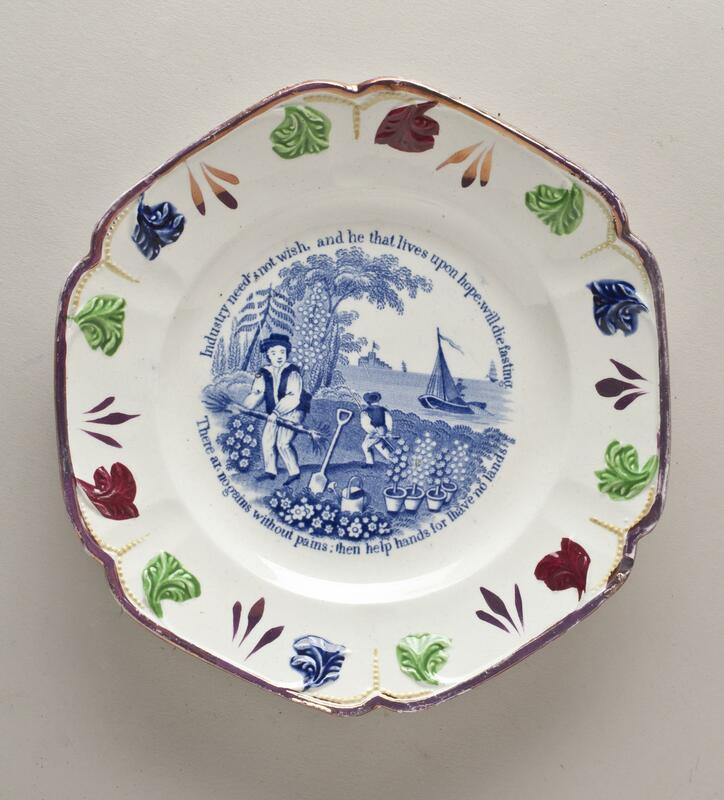 These plates were made for children as a tool of moral and educational instruction. 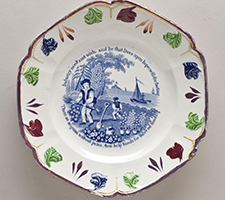 Although the maker of this plate is unidentified, the decorative themes show that it was made in England between 1830 and 1850; such identifications are the pastoral scene, the molded floral rim, and the glazed earthenware. The transfer printed design is another indication that this piece was made in the early 1800s. In transfer printing, tissue papers are used to copy the inked designs from decoratively carved copper plates onto the wares, saving much time. Transfer prints of Benjamin Franklin’s maxims on children’s wares rose to popularity in the mid-1800s. His memorable life lessons became popular since society of that time strived for self-improvement. Benjamin Franklin’s sayings were used to teach children life lessons on industry, temperance, and frugality. The piece above has one of Franklin’s maxims encompassing the illustrated pastoral scene: “Industry need not wish, and he that lives upon hope will die fasting. There are no gains without pains; then help hands for have no lands.” This proverb gives children the message that they have to work to get what they want as they can’t live off hope, for if they do, they’ll die of poverty. Parents gave these remarkable wares to children to promote hard work and diligence. The alphabet ware and the handkerchief above are connected in both their utility and their inscriptions. Both pieces have the maxims from Benjamin Franklin’s Poor Richard’s Almanack written on them. This artifact was also used as a tool of moral instruction for children in the early 1800s. The center of the handkerchief has a portrait of Mr. Franklin and the titles “Dr. Franklin’s Maxims” and “Moral Pictures for Youth” printed on. There are three maxims and illustrations surrounding his portrait. The maxim on the top left corner, “Want of care does more damage than want of knowledge,” is from the 1758 edition of Poor Richard’s Almanack. In this maxim, “want” means lack—Franklin is saying that a lack of care causes more problems than that of knowledge. He is advising children to take better care of themselves because their health is more important than their knowledge. Because of the small faded font of this handkerchief, the other two maxims cannot be read. 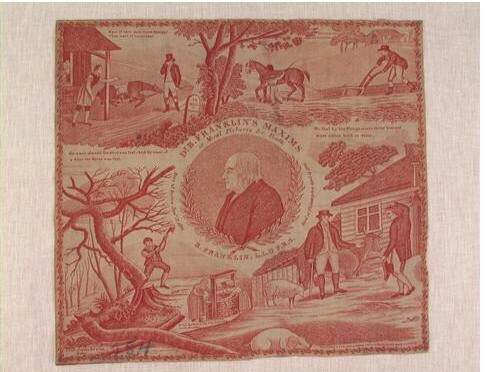 Even though they are illegible, the pastoral illustrations indicate that this handkerchief was intended to teach children that hard work pays off. The purpose of Ben Franklin’s maxims was to give advice to people—his life lessons were used to teach young children on how to live a successful life. Benjamin Franklin published his first copy of Poor Richard’s Almanack in 1732; a new almanac was issued annually for 25 years after 1732. He wrote the handbooks under his pen name Richard Saunders. Franklin’s inclusion of his maxims separated his almanac from others. The maxims gave advice about industry, temperance, and frugality. These life lessons—written in the 1700s and reprinted on plates in the 1800s—are still relevant today. For instance, “No pain, no gain,” is a common fitness motto used now in 2016, but this actually originated from one of Ben Franklin’s maxims, “There are no gains, without pains,” printed almost three centuries ago. Franklin’s maxims have been proven timeless and beneficial for all ages.